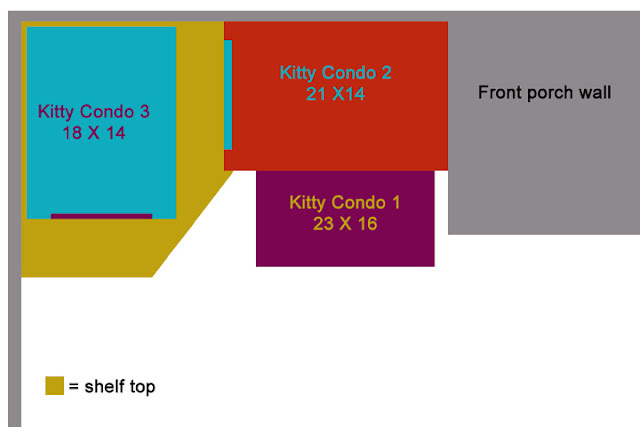 It is with great pride I present to you the master planned community known forever more as Kitty Condo Deluxe. This luxurious, exclusive, gated community features three distinct and individually decorated single room condos with plush terry interiors and optimal floor heating. The exteriors are a delightful terry texture adding insulation and good looks. But the fun doesn't stop inside. The outdoor environs allow for top of the condo lounging for those warmer days and more temperate night conditions. Super Deluxe Condo 1 even features an exterior love seat - perfect for entertaining. Stroll along the grounds to find the patio dining areas serving sumptuous gourmet meals three times a day. Drink fresh from the state of the art ever full water fountain. Relax in comfort on the grounds of this estate and feel free to pursue your favorite pastimes just steps away through two convenient doorways. ... and fade to black. I can't believe we did it - and in record time - and without personal injury. Let me share with you how it all went down. After clearing out the unwholesome nest of various debris (read all about that here), we set to work measuring and cutting wood. 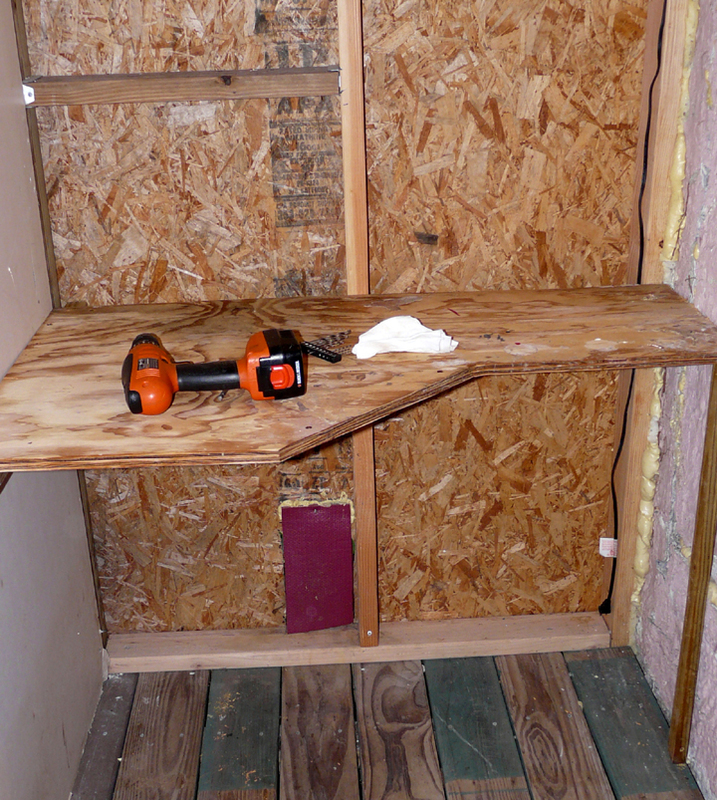 Here is the space with two of the cut pieces of lumber that will support the shelf top. That pink flap you see just to the left of center is a kitty access flap. We will have to make sure the shop vac does not conflict with their use of this flap. Here is the shelf top, cut to size and awaiting install. 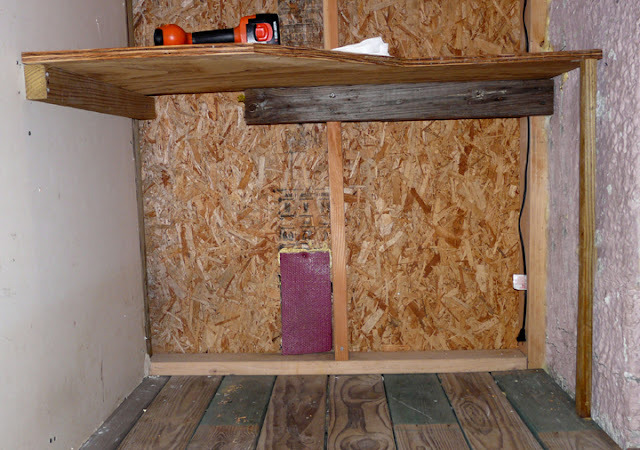 By this point we had taken measurements from many different places in the alcove, attempting to head off the cantankerous house syndrome that means there is no area that is truly square, level or easy to attach things to. Being veterans of past encounters we figured if we only had to re-cut things twice we would be doing better than usual. Oh My God! It fits! Well in this picture it does. What you don't see is the re-cut of the west support piece and the repositioning of the north support piece. It is up, it is stable and can probably support over 100 lbs which means it will likely be able to withstand the potential of 40 pounds of cat. That is why they make contact paper. Now we have a smooth, clean and above all, cleanable surface to manage the inevitable cat puke. So here it all is put together with the two kitty condos on top and the shop vac, kitty condo and kitty bed on the bottom. Although you cannot see it from this view, we managed to keep enough space between the shop vac and the cat flap that the kitties should have no trouble using it. However, all of this will be for nothing if the cats don't like it. Who knows what goes through their little feline minds that might cause them to reject this labor of love. I have created some flyers with the above sales pitch but will the advertising sway them? They have been completely absent from the scene the entire time we were doing the build out so it will be a complete surprise. What if they like only one of the condos? What if during the night they locate a cordless drill and dismantle the whole thing? What if they burst into tears and demand we put things back the way it was? The suspense is killing me. No worries. Here is Ike leading the cat appreciation front. It happens to be hot the day we finished this (of course) so he did not venture into the condos but leaped right up on top. Minor glitch, the condo wobbled. It was like I was afraid of, we really are going to have to bolt them to the table. Although it doesn't show up that well, we probably reclaimed several square feet of traffic area. Now things are mostly contained in just the alcove leaving us the rest of the porch to walk through. Success! So, after creating an improved kitty condo for the back door cat, we felt compelled to create the improved multilevel kitty condo complex for our front door quartet. This was going to require planning, potentially a lot of work and probably a complete redesign of whatever initial plans due to typical unforeseen complications, also known as old house cantankerousness. The best thing about the front door Kitty condos is that the 'condo' part is already made and what we are really doing is creating the condo environs. In other words we want to make a spot that will 1) provide easy kitty access to said condos and 2) not get in our way as we try to enter and exit via our front door. Point number 2 has been a sore spot for us for the last 4 years of the front door cat era. Their 'things' are always in the way be it food bowls, water bowl, cat condos, cat towels or the occasional dead animal. The kitty 'footprint'. 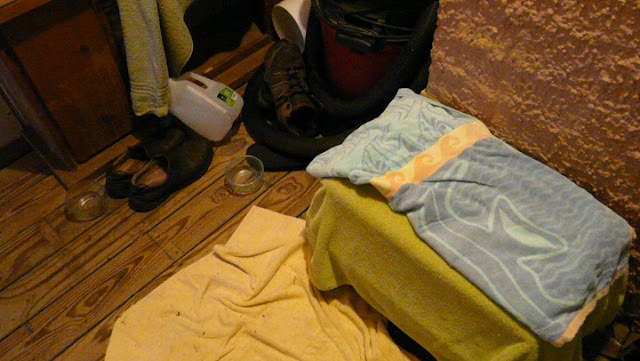 Lets see cat towel, kitty condo, cat food bowls all competing with space with the human shoes, shop vac and the empty water jug a cat has knocked down. There must be at least a foot of space for us to walk through. What are we complaining about? Thankfully, no dead rodent to leap over today. This is the 'before' view of the proposed kitty condo area. There seems to be a very small and very specific black hole in there that draws in various junk, much like a magpie might take shiny things to its nest. 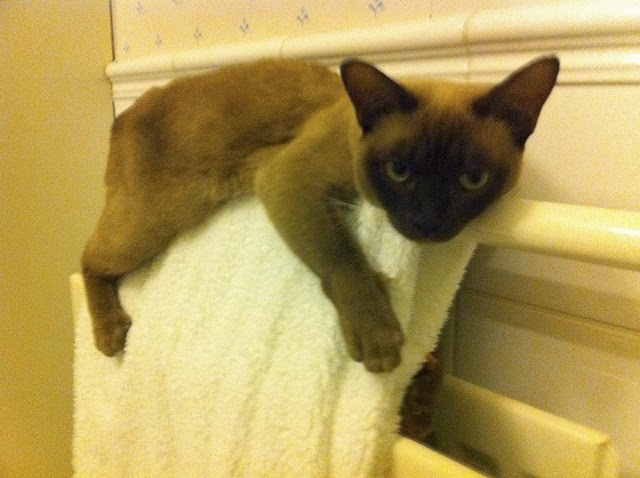 That rakishly tilted towel is another signature of our fractious felines. If it is not nailed down, they will rearrange it. Cats are in many ways akin to teenage humans in their independence, aloofness and as we discovered, messy room ways. We can lay out a very neat and tidy cat towel placement in the evening and by morning they have mussed it about and rearranged it to be maximally in the way of our coming and going through the front door. They knock things off shelves and never pick up after themselves. They have knock down, drag out arguments over who gets what part of the front porch. They do not like to share their things with one another. And yet, on a cold morning we will find all four of them in a kitty pile up atop their two heating pads. This information lets us know that while everyone needs to have their own space, they also need to have a way to cuddle together when the mood strikes them. They want to be close to each other, but not too close. Anything we create for them has to be sturdily attached to whatever it is resting on. Everything we create for them has to be positioned in such a way they cannot rearrange it into the chaos they so love. We have three kitty condos that are ready for use. 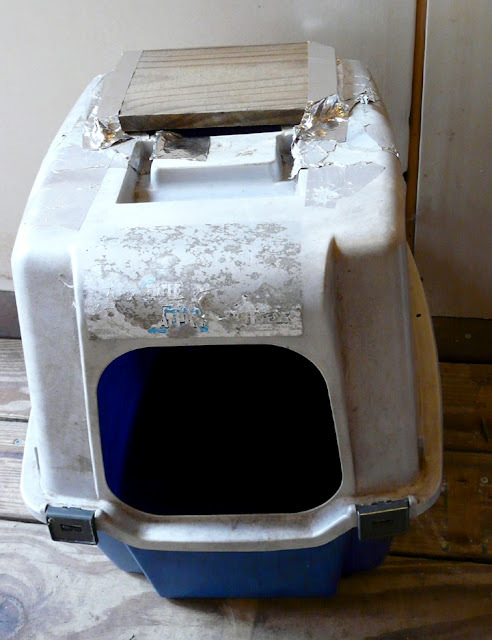 One is a refurbished covered cat litter box that is 18 inches long, 14 inches wide and 18 inches tall. It has seen better days and is probably about 7 - 10 years old. 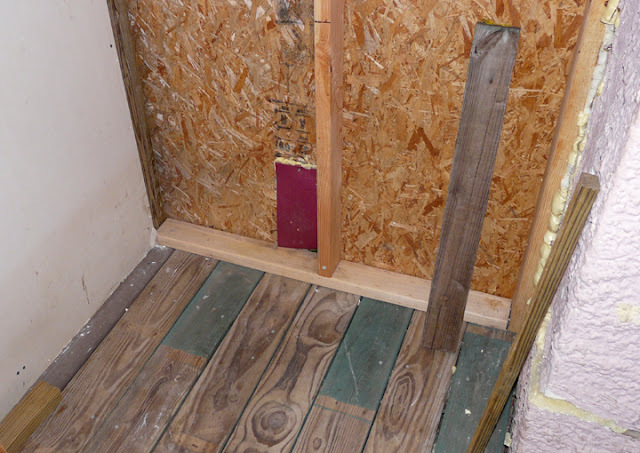 You can see where I have taped a piece of wood over what used to be the hole for the shop lamp. 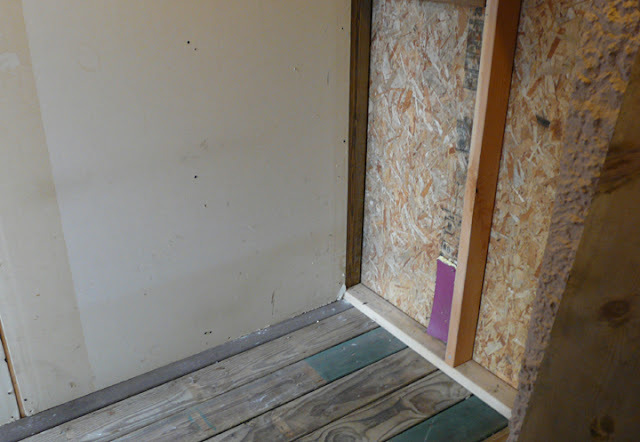 The very hole that used to be a vent for this covered cat litter box (you can find my rant about it in this post). I plan on installing a heating pad for warmth, along with several cat towels for warmth and comfort. One box is a refurbished storage container with a hole cut out of its narrow end. It is 21 inches long, 14 inches wide and 16 inches tall. I have taped a plank of wood across the top to cover the hole that allowed the lamp heat through. 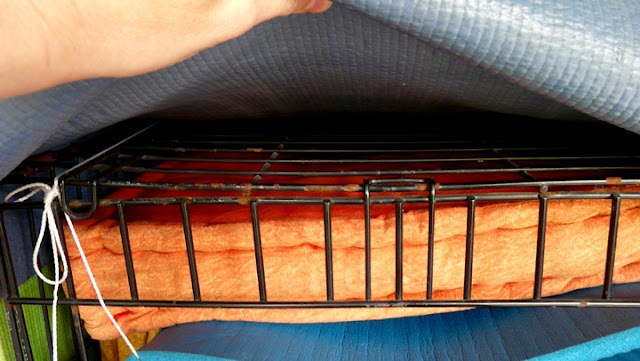 Here you can see inside where I have the heating pad in place. I will cover the heating pad with a blanket and drape blankets around the box as well. 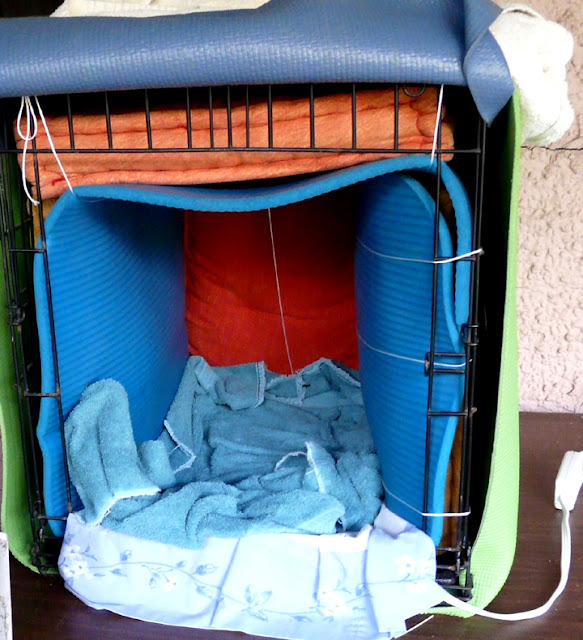 The third box is an actual pet crate that is 23 inches long, 16 inches wide and 16 inches tall. Thankfully I did not cut a hole in this one, so no tape needed. It has its heating pad ready to go. 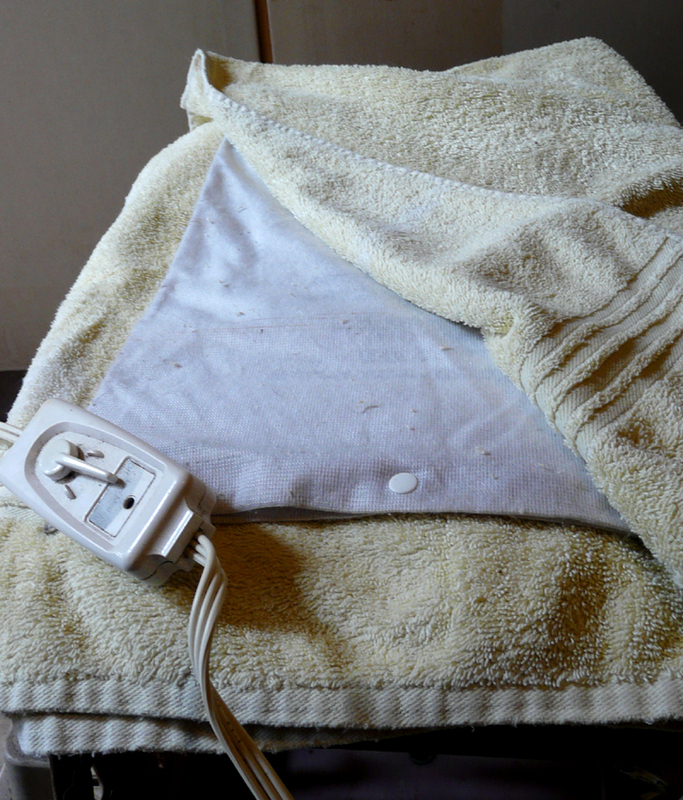 Here is how I cover the heating pad by nestling it inside a folded towel. 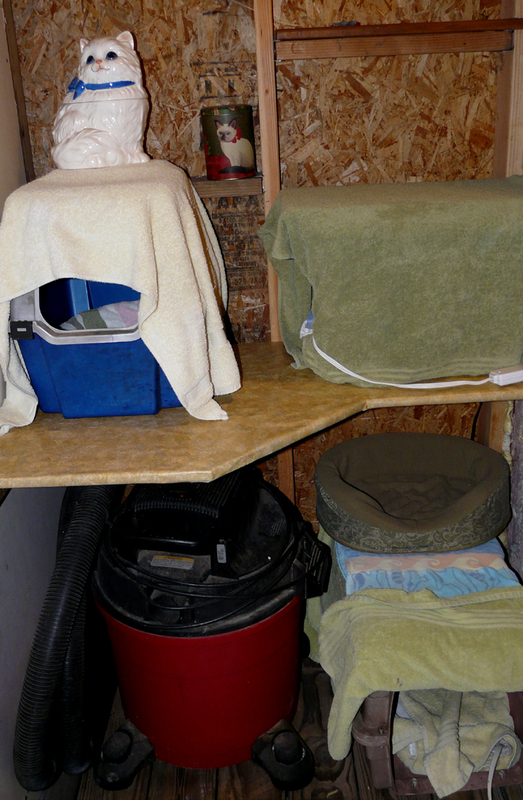 Here is how the whole thing looks with cat towels inside and out. This one is big enough we will have room for an open air cat bed on top of it. Now we just need to create the space for the three kitty condos and the shop vac. The space we have available is a small alcove off the front porch that is 44 inches wide and 21 inches deep on one side and we have about 25 inches of space available on the other side. Here is what the space looks like with all the crap removed. Surprisingly the debridement only took about 15 minutes. Of course now all the stuff is just sitting outside the front porch, but since the area I need to work in is clear I am chalking that up on the win column. Here is the plan I have created for this space. This is the view from the top showing the shelf unit we will install in the alcove. 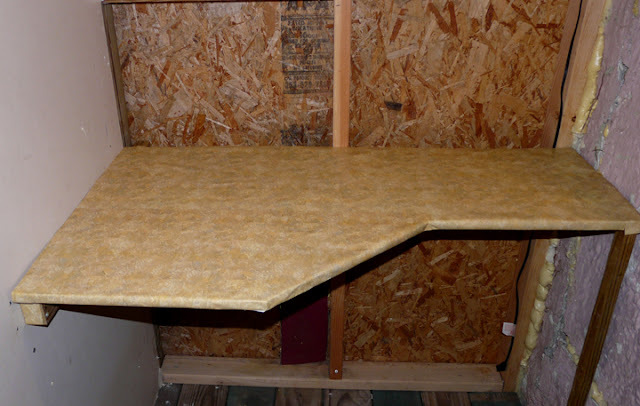 The shelf top is 24 inches wide on one side and 14 inches wide on the other end. 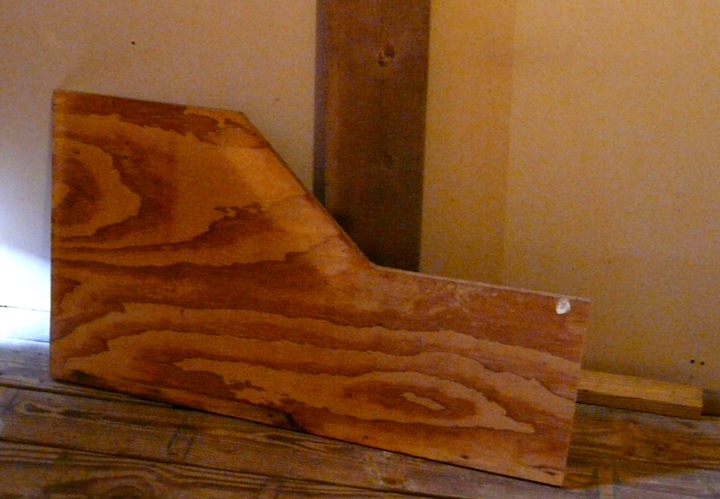 We are harvesting this shelf from our workshop. I can't remember when we last had to create anything new. 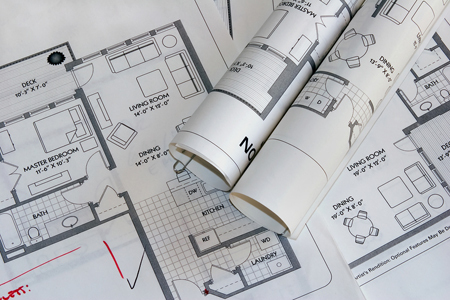 We just move the things we have already created from one place to another. Right this shelf it is a little longer than the alcove, so we will be trimming it to fit. The back edge we will brace against the north and west wall of the porch alcove and the front edge will have a support leg. Below this shelf will be Kitty condo 1 on the right. On the left side is a space for the bulky shop vac that also needs to live on the front porch. We want to leave enough room for the shop vac to fit under the shelf without giving the kitties any unnecessary access above or behind it. Above the shelf and resting on it are Kitty condo 2 and 3. Kitty condo 2 will be on the right side of the shelf and since it is 14 inches wide it will just fit. 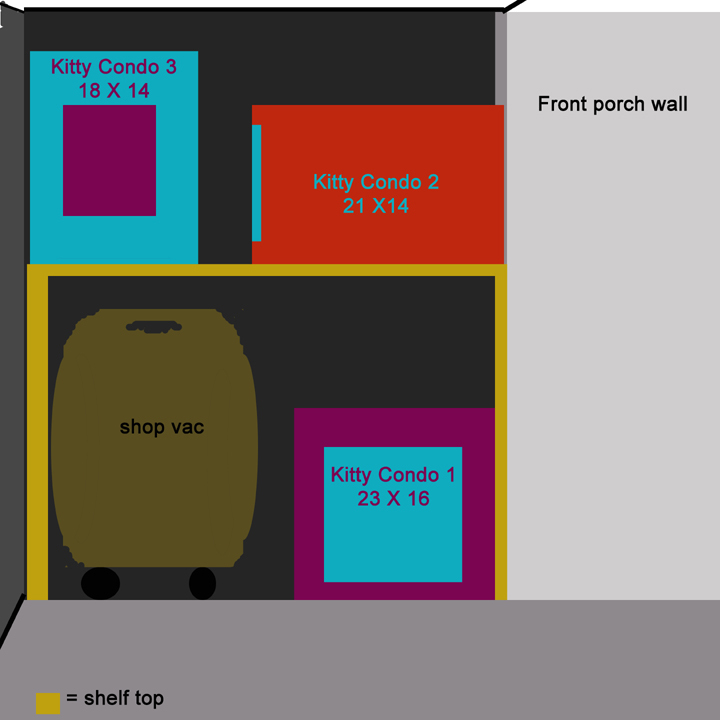 The access to the condo is through the narrow end which will give the cats about 8 inches of space between it and Kitty condo 3. This should be ample space for them and as a bonus they can also lounge on top of this condo. Kitty condo 3 is the tallest and shortest of the condos and will fit with its access door pointing toward the front of the alcove space. The cats will be able to reach it via a six inch front area, which again, given cat agility should be ample room. Although this condo is somewhat dome shaped on the top, many a cat has perched there before, so we anticipate them using it that way as well. Both condos will have to be wired on to the shelf in order to keep the brawling quartet from knocking things asunder. It might seem like large objects resting solidly on a flat surface would not be particularly tip prone, but these guys are a professional disruption crew and God only knows how they might do it. If there is a way, those condos will be on the floor unless I do the equivalent of bolting them to the shelf. Seen from the front of the alcove. The arrangement shows the shelf unit is positioned 30 inches off the floor, leaving enough room for the shop vac to easily be maneuvered in and out. Kitty condo 1 rests on the floor to the right and there is quite a bit of space for a cat bed on top of it. So that is the plan and all we have left to do is 1) deconstruct the shelf top from where it is in the shop and refit it to correct length for the alcove space, 2) install the shelf into the alcove space, 3) arrange and secure the kitty condos on the shelf, the shop vac beneath the shelf and the other kitty condo beneath the shelf, and 4) swath the kitty condos in cat towels and heat with heating pads. Tada. I only count about a dozen ways this will not go smoothly, up to and including complete rejection by the kitties it is being created for. It's that time of year again and as the chilly weather descends I once again begin to agonize over how comfortable my cats are. They live outside and very much love that arrangement. They are free to range around and do cat things and have a constant food and water supply along with the comforts we provide them. We live inside and very much love not having cat dander, cat hair and the inevitable litter box inside our small house with us. Not to mention cat poop in the dryer (a trio of incidences in our distant past which involved my currently oldest cat, two pristine, clean and unused litter boxes, an open dryer door full of clean dry towels, all mixed with the typical insanity that is known as 'cat'). Needless to say, we are not about to resolve the cold weather scenario by bringing 5 cats into our two human and two dog household. With the Border Collie in residence we already have an organic shedding machine capable of creating virtual snow drifts of hair (dust puppies) every day. Seriously, if you leave something on the floor without picking it up and sweeping beneath it for longer than a week an amazing raft of hair (shed-lock) secretes itself beneath the object causing involuntary flinching when said object is moved. Add five more hair contributing creatures and we have the makings of a horror flick (it lives under the chair!). 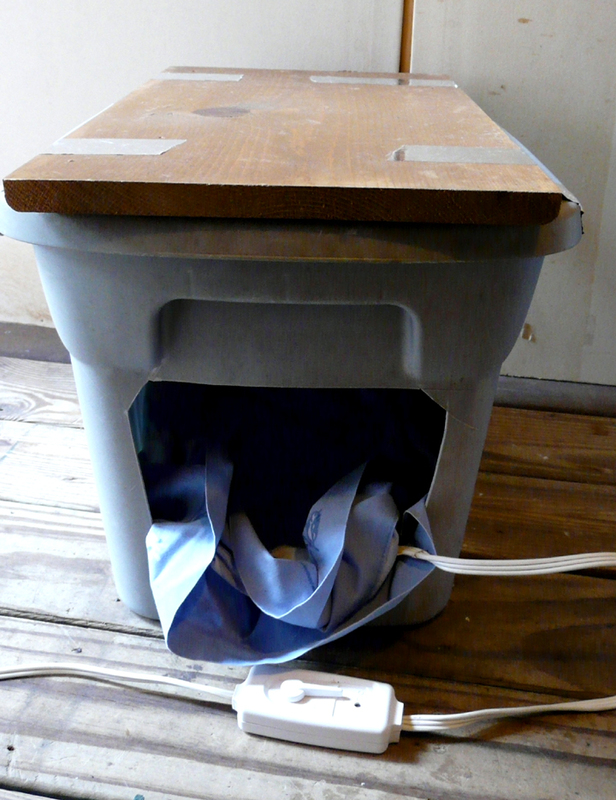 Indeed that enclosed cat litter box not only worked great to reduce the cat litter box explosions in my life, but also worked great after a retrofit as a kitty warming box. 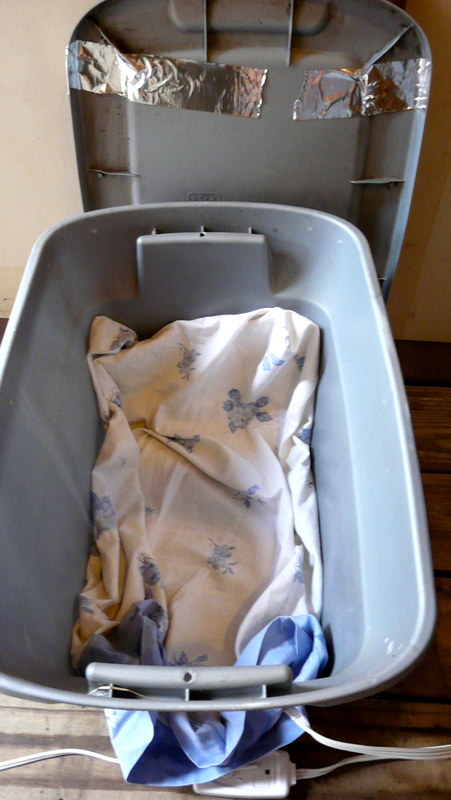 I had two boxes and at the time I had two cats and they worked great all winter long with snuggly warm kitties encased in towel covered and towel lined boxes. Perfect. But then of course, I had to go and think about it. At the time I was using 75 watt bulbs to give off a very strong heat. Then I ran out of 75 watt bulbs one evening (the bulbs lasted a reasonable time, but cats being who they are liked to lounge on top of the crate and would occasionally knock them off and break a bulb) so I used a 60 watt bulb instead. I noticed this reduced the 'brightness'. That got me to thinking - just how healthy was it for my kitties to be constantly subjected to bright light? Was it throwing off their kitty circadian rhythm? Did it disrupt their kitty REM sleep? Does a creature that sleeps 20 out of every 24 hours even have a circadian rhythm or is it more of a flat line? So I purchased an expensive red heat bulb designed for heat loving reptiles. That solved the bright light problem and seemed to create a wonderful heat. The cats loved it. 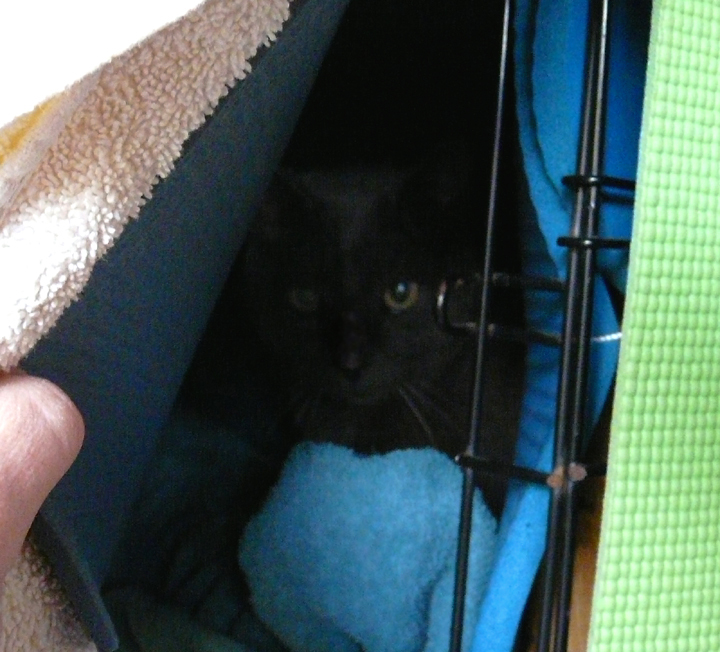 But what they loved more than being in the crate was resting awkwardly on top of the crate, half of which was taken up by the hood of the lamp, leaving only a small space that a very determined cat could squinch itself into. They would climb into the crate only when it got truly cold at night. This top of the crate perching led to that expensive light lasting only one week due to repeated cat toppling. So I discovered that black light bulbs were less expensive, put out less light that I could see (mind you it did spark me to a fruitless internet search on what light range was perceptible to cats - uhh, better than us?...) and was very warm. 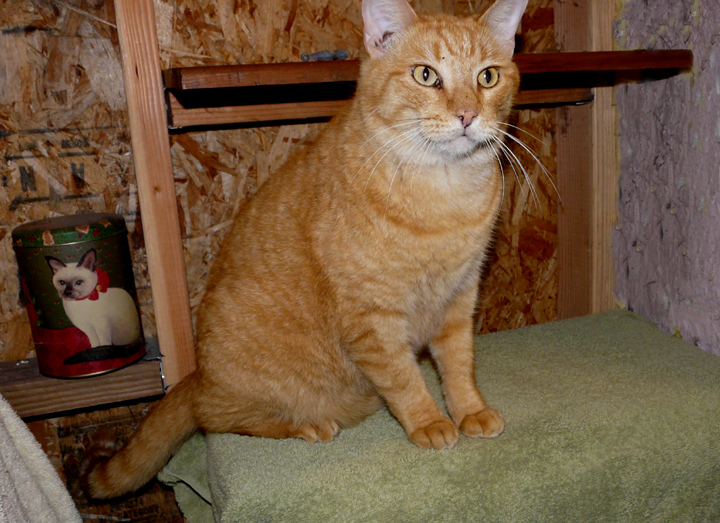 The cats seemed to do fine with this change and continued to perch atop the crate. 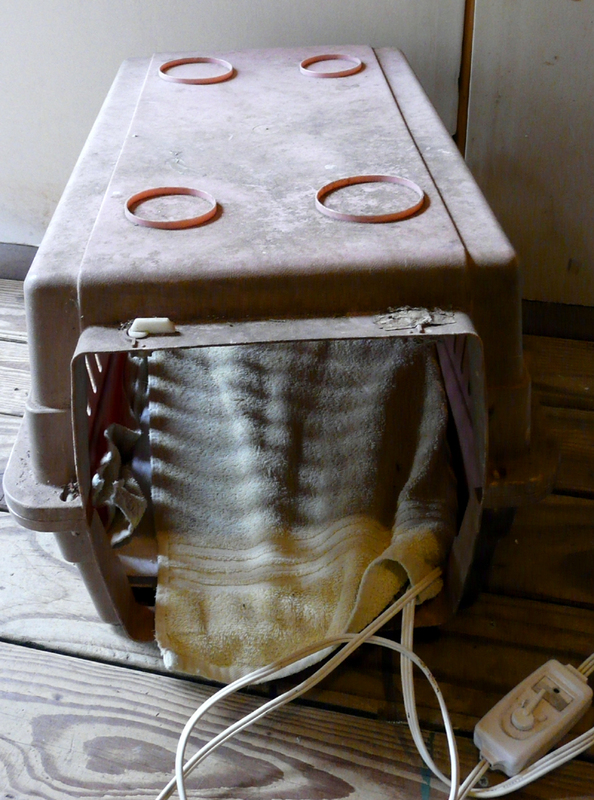 Thus ended that cold season and I put the crates away with just a brief foray into researching heating pads for cats. After all they seemed to like the heat coming up from below ("Hello," my cats said - "care to notice how we awkwardly perch here? Think that means anything, hmmmm?"). I gave up this search after finding that, 1. 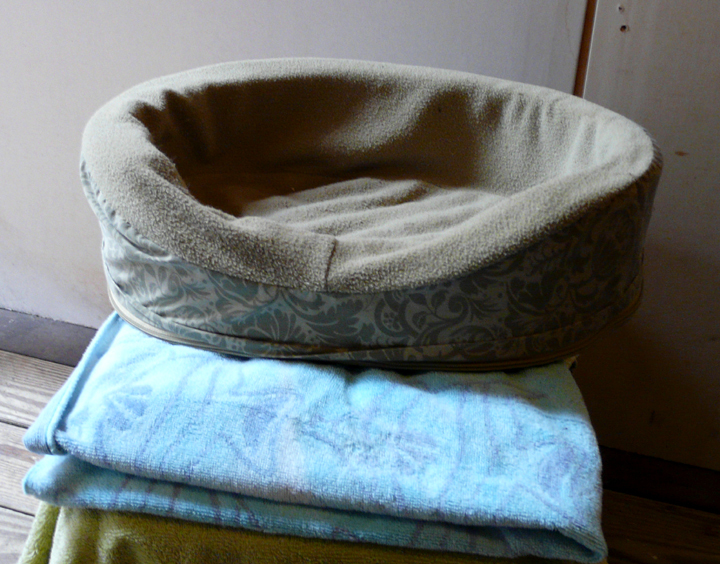 Yes, they did make special heating pads for animals, and 2. Special meant expensive. And so I put it out of my mind thinking I would resolve it the next season. Fast forward to the influx of way too many cats and cold, very cold, winter weather on the doorstep. I needed enough warm space for 8 cats, two in the backyard and 6 in the front. At that time we had not enclosed the front porch space. 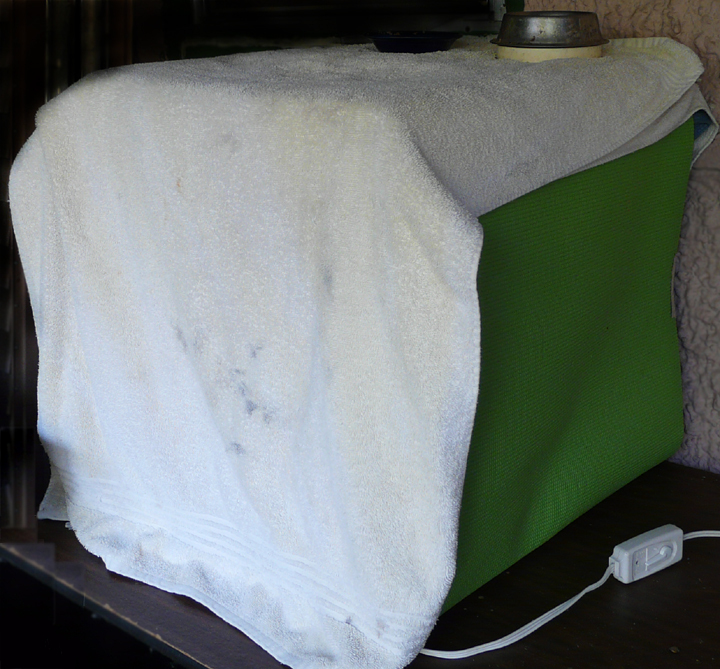 For this scenario I created another light box by cutting holes in the top and side of a small storage container and scrounging a couple of human heating pads to go into a couple of other storage containers turned on their side. 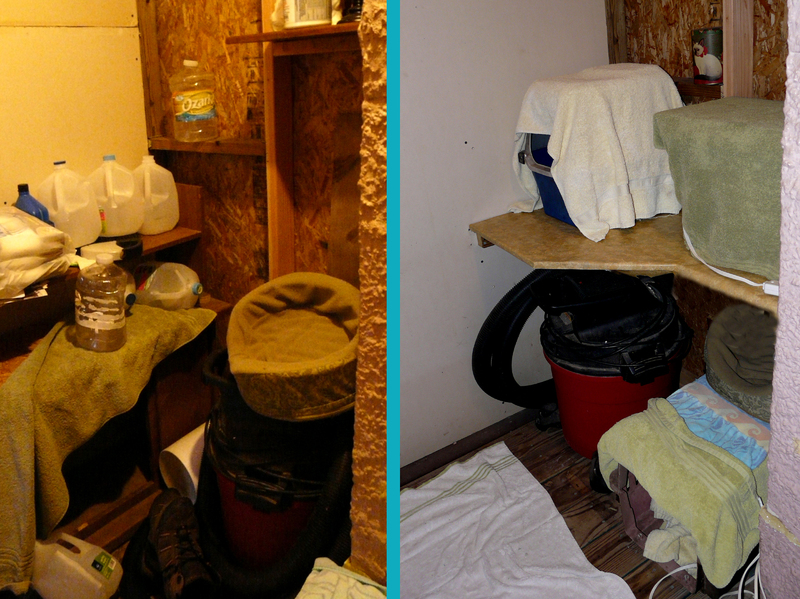 The whole complex was swathed with bath towels inside and out. Three new kitty warming containers for the six kitties worked just fine (here I must point out how utterly frustrating it is to have almost all your bath towels being used for the cats and the ultimate designation of certain towels being forever more labeled as 'cat towels' - more about that here). But were they comfortable enough? Thus my husband and I rebuilt and enclosed the front porch by the next winter. They have a raised wooden floor and slowly but surely we have been finishing out the walls for greater insulation and installing a separate wall socket so we don't have to run power cords under our front door anymore. This brings us to today and the beginning of the 2012/2013 cold weather season. It has not gotten really cold yet and does not look like it will be very cold for maybe a couple of more weeks as well. Me being me, I got to wondering just how comfortable my cats are again and so I have been building and scheming once more. I present for you Kitty Condo #1. 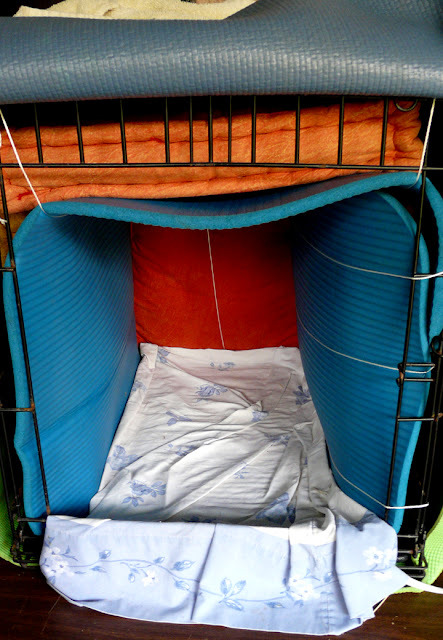 This enclosure uses a medium size metal dog crate insulated with 4 square pillows inside (top, back and sides) along with a thick exercise mat between cat and pillows. 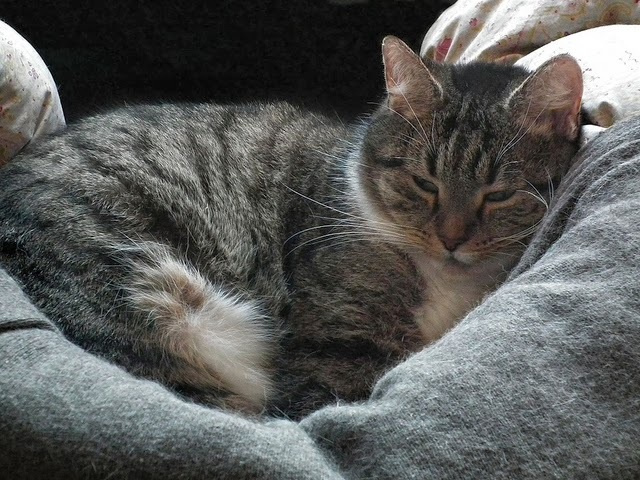 The pillows will be a total loss after this, no doubt, but delaying the need to replace the cat fouled pillow with an easier to clean barrier that also provides insulation was the brainstorm of my dear husband. Here is the view of the top. I secured the pillows and mat with loops of string interwoven with the metal bars of the dog crate. I must confess that the current arrangement went through several incarnations, one of which was having one of the plastic storage crates inside the dog crate and surrounded by pillows - but that looked 'cramped' I decided after spending an hour putting the whole thing together (I don't want my wittle, bittie, kittie to be cramped!) so I dismantled it and started over. It is heated by a large human heating pad (on low for now) which is covered by a pillow case. A layer of bath towel also covers the heating pad to make sure the heat is never overly intense and to cut down on the need to change the pillow case as frequently as well as absorb any 'cat puke' situations. The towel also provides additional snuggly warmth and changing towels is one of the quickest ways to satisfy the kitty's need for fresh bedding. The exterior of the condo is covered by two thinner yoga mats, front to back and side to side arrangement. 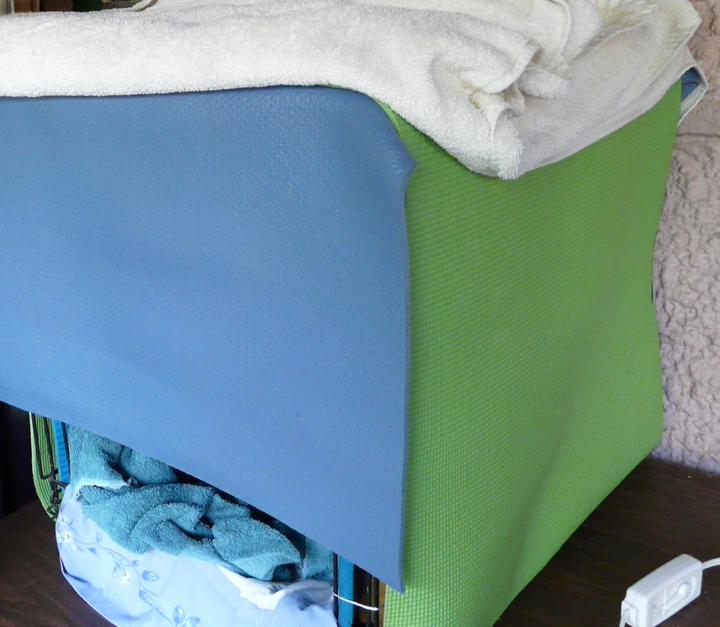 The outside is also covered by two bath towels. 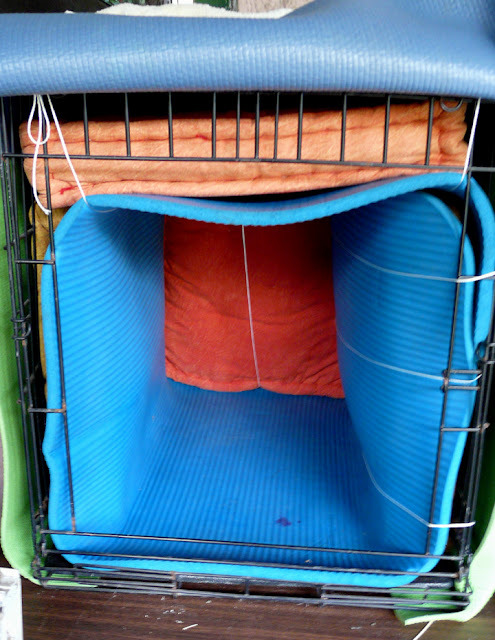 This kitty condo allows for an interior cat space of about 16 inches high, 14 inches wide and 18 inches long. The top of the condo is the kitty feeding area. Mr. Dory the 15 year old seems to love, love, love it and who wouldn't. He can stretch out, stand up, and do kitty gymnastics if he wants inside his warm dark condo. 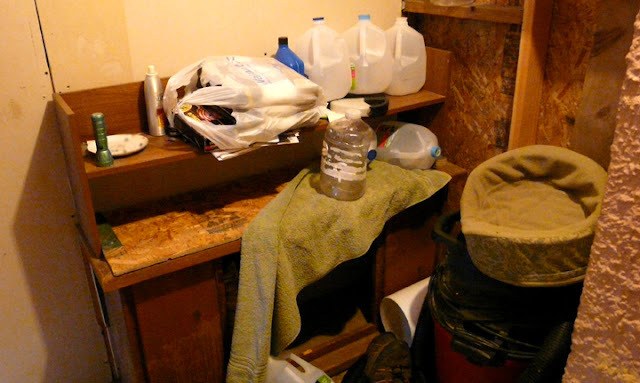 The whole arrangement is sitting on top of a table next to my bedroom window, well outside of Border Collie nose range and well within my monitoring area. His towels are changed once a week and his wet and dry food bowls are within easy reach but not stinking up his crate when he is done eating. If he weren't such a loner he would probably be inviting his teenage friends over to chill in his new crib. We are holding off on installing the flat screen TV, cable internet, surround sound audio and mood lighting for now. One down and now on to the front door cat comfort challenge... stay tuned. So, it has come to this. Our cats have more bath towels than we have. It didn't start out that way, in fact for most of our lives we lived totally devoid of the knowledge there was such a thing as cat towels. But that was long, long ago and another lifetime it seems. Today and forever more we are bounded by cat towels. What are cat towels you ask? Well, to all intents and purposes they start out as regular human bath towels. 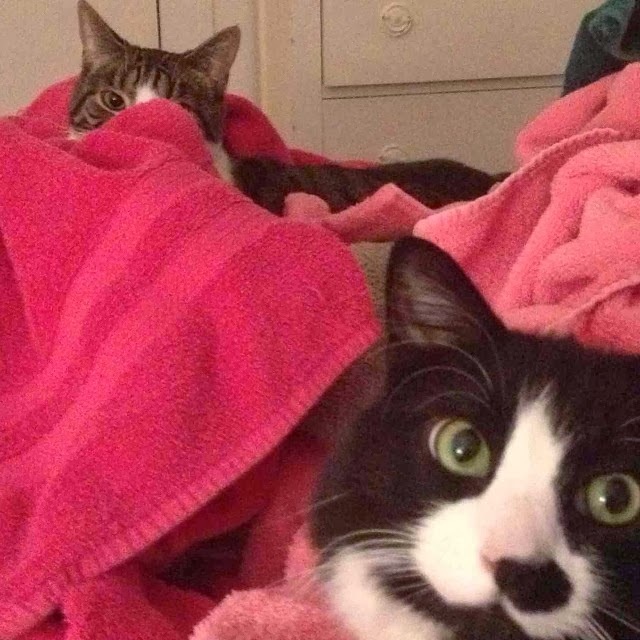 They will spend anywhere from several months to sometimes only a week in this part of their life cycle, but at some point on the towel horizon, they devolve into a steadily worse condition known as cat towel. 1. It starts as a newly purchased towel. It is freshly washed and folded and sitting on the bathroom shelf. 2. This freshly laundered towel is used, rewashed, dried then folded and is again sitting on the bathroom shelf. A defect such as an unraveled seam or a mysterious hole or stain appears. The towel is used to mop up something off the floor and acquires a hole or a stain, or has become 'tainted' from being on the floor too long or mopping up something too foul. The towel gets randomly recruited into cat use because there are no other towels available, or maybe just because it was easier to get to this one than one of the actual cat towels. A case of mistaken identity (the towel looked too much like another cat towel). used to line or cover a cat crate. placed on the cat floor area. placed on the dog floor area. placed on an interior floor area because it is wet. used to block drafts under the door. used to dry the washed car. used to mop up something foul. The towels are taken to the furthest part of our yard and shaken vigorously to remove cat debris, leaves, and various substances we will call 'cat cooties'. 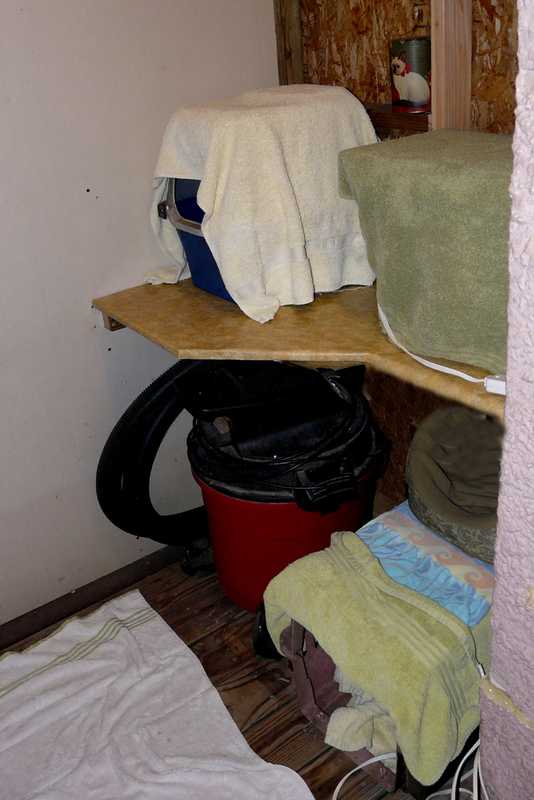 After shaking, the towels are left to further disinfect in sunlight, sometimes for days and perhaps even through several rain storms. 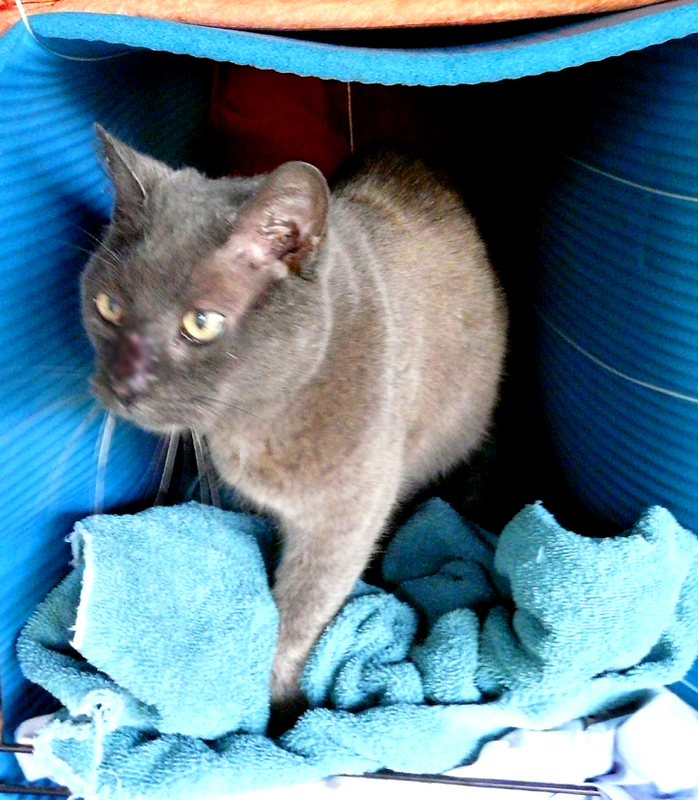 The pretreated cat towels are loaded into the washing machine and washed on hot along with bleach for one cycle. 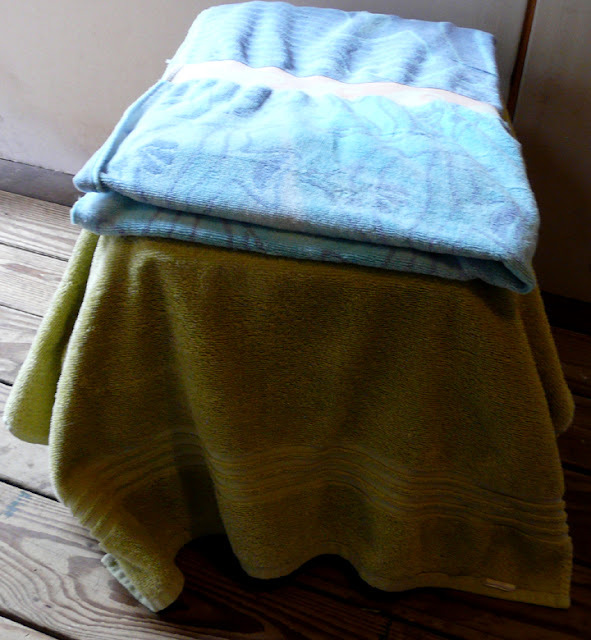 The towels are washed for a second cycle on hot. The towels are rinsed for two cycles to remove all detergent/bleach. 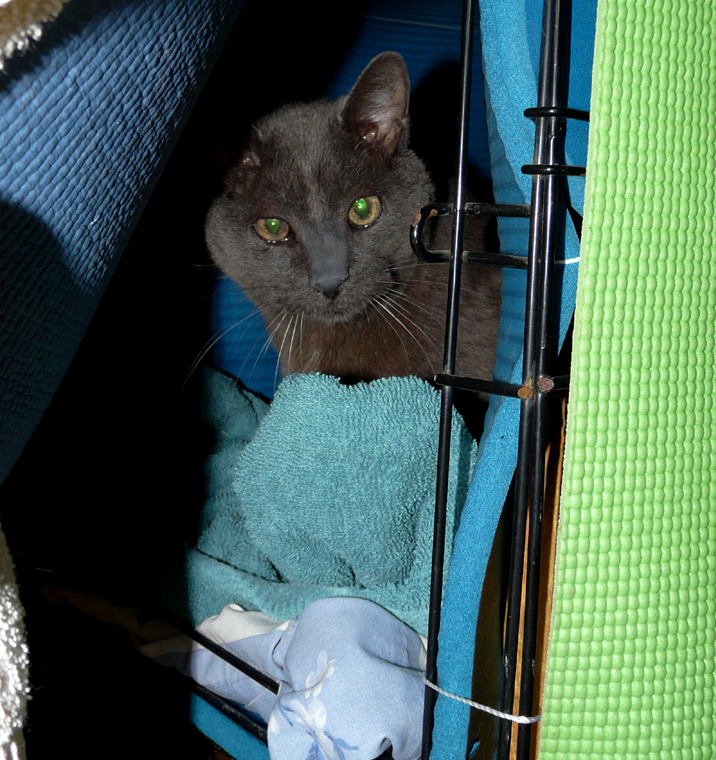 The towels are dried in the hot dryer, then folded and placed on the special 'cat towel' shelf. The cat towels will continue through the use and cleaning stages until they become so thin and threadbare you can read through them. This whole cycle can take place over the course of a year or two to sometimes less than a month. Eventually the towel is deemed too icky to actually use or clean and is thrown away. 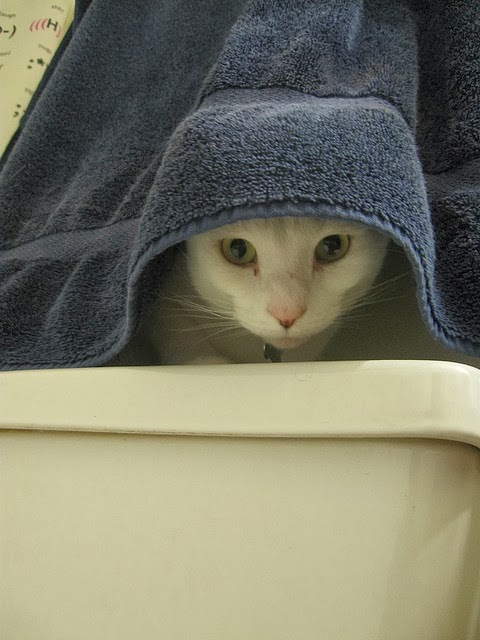 This vigorous disinfection of the cat towels is so that - just in case we would actually have to use a cat towel for a human reason - we will not be inflicted with cat cooties. Cat cooties are an undefined lingering 'catness' that no reasonable person would want on their body. Our cats love the arrangement and so do our dogs. There are probably no creatures in a 500 mile radius that appreciate thoroughly laundered towels as much as our crew. If you put down fresh cat towels our feline crew will come running to roll decadently on the fresh new towel. They will actually fight each other in order to lay claim to an especially wonderful towel. They get fresh cat towels at least once a week and the only thing that delays this is the overwhelming arduous burden of actually washing a load of cat towels. To keep the washing scenario to a minimum we have lots and lots and lots of cat towels. 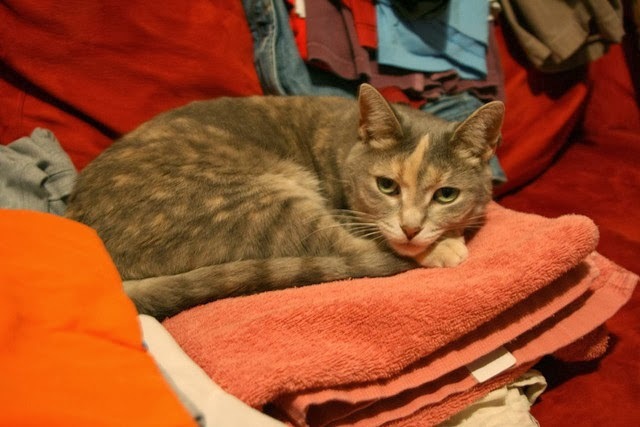 But because the process of washing cat towels takes so much effort, there are always lots and lots of cat towels desperately needing to be laundered. 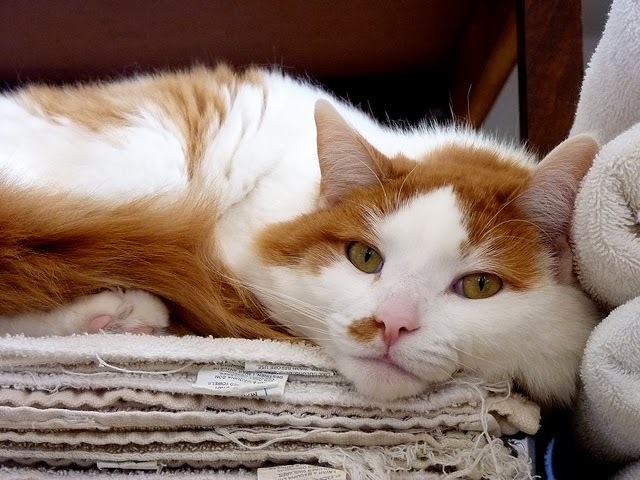 After all, it would be inhumane to leave our cats without a towel while we laundered cat towels and when we replace the used cat towels with those freshly laundered ones... well, we have just created more cat towels to wash. Such a vicious cycle. Our dogs appreciate the cat towels as back porch towels that they use to wipe their feet on prior to coming inside (not that they actually wipe their feet, but the standing on the towel while you whine to get inside serves sort of that purpose). 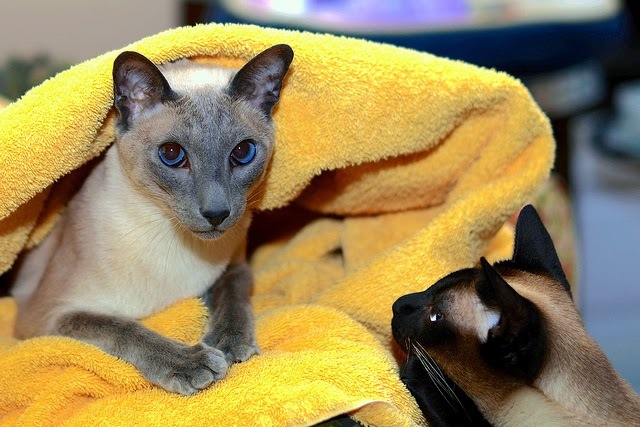 They get cat toweled off when they come in from particularly wet or muddy prancing in the backyard. They lounge on cat towels placed on the back porch in sunny areas. They snuggle into cat towels on 'cold' days when we somehow can not hear how much they would prefer to be back inside because we are having something they would like to eat. We don't actually use the cat towels to dry off our dogs after a bath. Apparently dog cooties are not harmful like cat cooties and we willingly share our towels with them without prejudice. Mind you, immediately after toweling off the dog you don't want to mistakenly rub that towel anywhere on your body unless you want to wear some fur. I just mean that we wash the dog towels the same as people towels. All this cat towel business means I purchase new towels at an alarming rate. I can assure you there is very little difference in survivability from a high quality towel versus an economic towel in our system. Before the cat towel era, I used to purchase high quality thick, plush bath towels and these by and large became in time, cat towels. These days I don't purchase the most bottom of the barrel cheap towel because I would like to towel off with something thicker than a tissue paper and softer than steel wool, but I generally purchase just one step up from the cheapest. Yes, some better quality towels remain human towels for longer, but it all ends in cat towels. Sooner or later it all ends there (sometimes for reasons of mistaken identity, much sooner than reasonable). I can also say that the better quality towels linger in the cat towel sector for longer. Sometimes I will run across one of the veterans and reminisce with it. "Remember when you were brightly colored, thick and un-marred?" I say to the battered remains. I may be the only person on the planet that suffers from towel nostalgia. I know that it is said that couples develop an interior language all their own. I can certify that this is absolutely true. When I or my husband say cat towel, we both know exactly the 'not fit for human use except in extreme need, yet totally necessary to our lives' item we are talking about. Someday I expect to see it defined in the dictionary.